I have an admission to make. My history is littered with projects that were started and abandoned. It’s a trait I’m not proud of and one that I was forced to take a microscopic look at as I was writing The Purpose Project. There’s a saying that ‘we teach what we most need to learn’. In my case, it seems, ‘I write what I most need to learn’. Yet I know I’m not alone. It’s a common human trait. I believe that our inability to commit to projects and see them through can have dire long term consequences and that this ineffectiveness stifles our capacity for reaching our highest human potential. So why do we abandon projects? There are many reasons. We may choose the wrong project in the first place because we haven’t done the deep work required to determine if the project really, truly matters to us. When we do get started, we give up too soon if it becomes hard or we feel like it’s not gaining the momentum we’d hoped for. And finally, we may bite off more than we can chew, we set ourselves an impossible goal that renders us immobilised and ineffective. 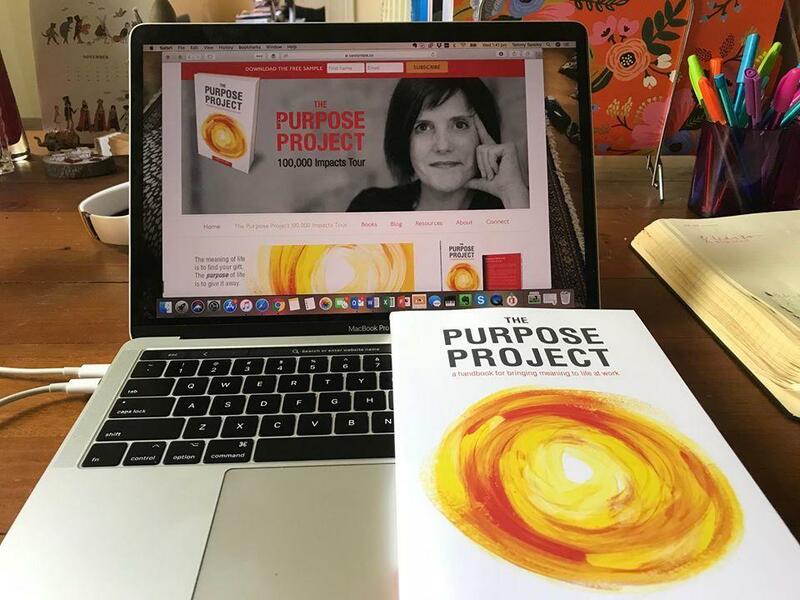 Writing The Purpose Project has been a series of projects in, and of itself, each with varying timeframes and objectives. The first project was to write the manuscript, a project that took 16 months. My second project was to edit and publish the book, a project that took three months. The third project was to launch the book and to have 1000 books in the hands of people within one month. After a whirlwind month connecting personally with hundreds of people to share the book, I’m happy to say this goal was achieved! My deepest thanks must go to my family, friends, community and the many strangers who believe in the power of purpose as much as I do. At the end of this project, on Saturday night, I took to the dance floor to celebrate before two days of complete rest. No digital devices. No plotting and planning. No people. No place to be. I read an exquisite novel. I slept. I rested. I rejuvenated and I hit the reset button. On Tuesday, I returned to work. I was restless and uncertain. What will my next project be? How could I possibly achieve my vision to bring purpose to life for millions of people at work while also achieving my prosperity goals? I’d had so many doors opened to me over the last month that I was confused and uncertain as to which ones to walk through. I felt scattered and directionless. Should I develop a digital program on the back of the book? Should I partner with companies to deliver purpose workshops to their people? Should I Iicense The Purpose Project to coaches or coaching companies? At the same time, deep down I knew that I’d bought into the limiting assumption (and common narrative) in the business book-publishing world, that “authors don’t make money from books” – that they’re just an expensive calling card for securing other services such as consulting work and workshops. So, over lunch that day, I had a brilliant thinking session with my friend Matt. I was reminded of my highest purpose; to write books that truly matter. I was challenged to remove that limiting assumption and consider how the book could fulfil my need for both purpose and prosperity. It happened on Wednesday morning at precisely 3am. I awoke abruptly with a deep knowing what my next project must be. By 6am I’d written the plan and by lunch time I’d taken the first steps to make it happen. It’s a BHAG (Big Hairy Audacious Goal) that scares the hell out of me, yet it’s a project that I simply can’t not do. And it’s the subject for my next blog. Till then.